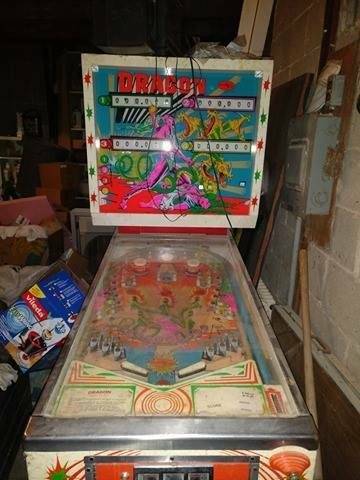 A friend had this machine in his garage. We elected to restore the machine and keep it. Upon further investigation, this was not going to be a simple restoration. A squirrel decided to call this cabinet home. It comes completely furnished with insulation, feces and chestnuts. Nonetheless, we are donning the rubber gloves and saving the table from the junkyard. 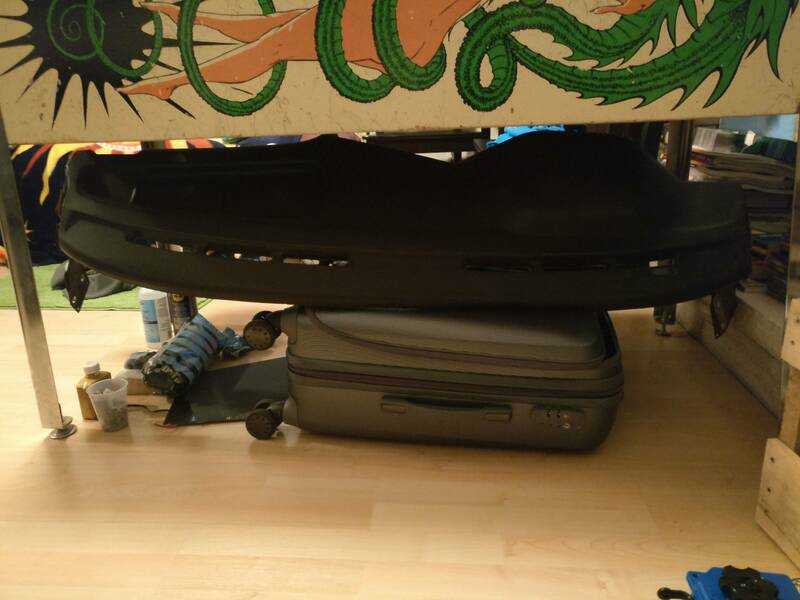 Tonight we will be taking a vacuum to it and seeing the extent of the damage to the bottom. Any tips (other than throw it in the garbage, burn it, etc.) would be appreciated. Ouch! Well we'll see when you get to the bottom...whatever happens we can;t let a Dragon die...such a classic game. Hope you're able to bring it back to life. Just think, when you're done with the resto, you get to hear that unique Dragon "whaaaaah" noise all the time. it's no big deal and you can easily clean out any.......Oh my god, don't look at it! I don't know, I just don't know if this can be saved... Best of Luck! I didn't think it was too bad...until I saw the squirrel finger paintings on the inside of the cabinet. Well, we took a hearty stab at it tonight. 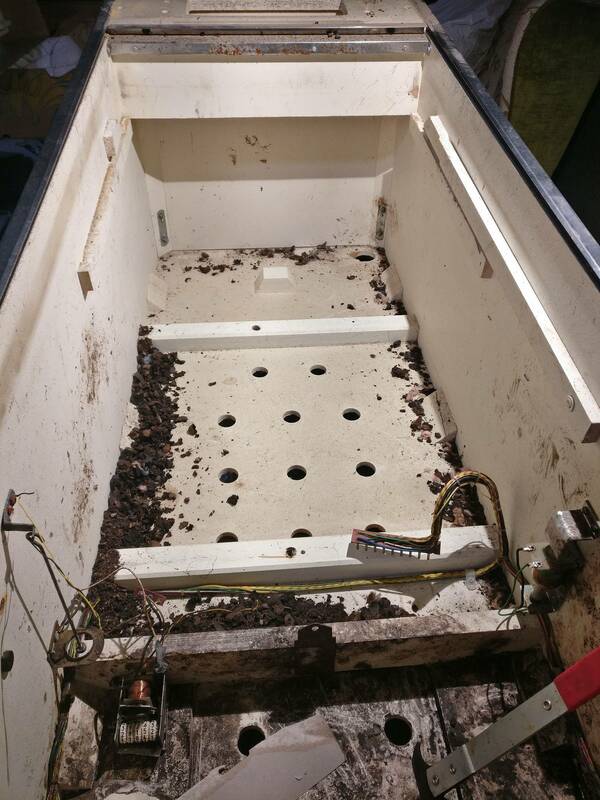 We spent a solid 2 hours (3 people) removing solidified, frozen feces from the bottom of this machine. All of the contacts connect to a rail with pins to hold them in. This minimized the cleanup effort greatly. I am so grateful that most of the components are easily removable. The bottom mech board on all of the Williams EMs I have seen can be easily pulled from the cabinet by removing 5-7 Jones Plugs and two giant bolts. I have no idea if this can be easily done on the Interflip, but you will save yourself a world of trouble, not to mention back pains, removing the mech board and working on it on a bench. You might as well remove the mechs from the mech board while you are at it. I remove any labels, sand down the board, clear coat it a few times and put the mechs back on. Wiring harnesses can be cleaned too. It depends on how much work you want to do. 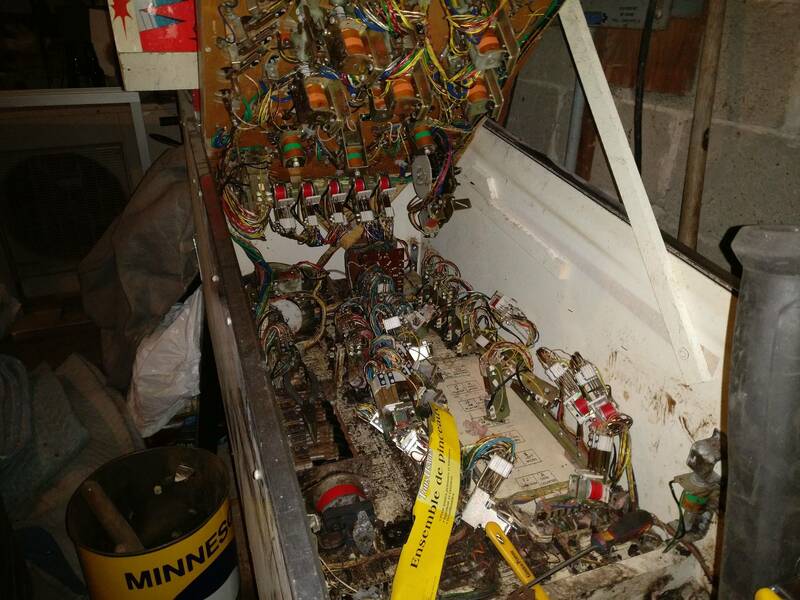 I have removed all of the mechs, transformer, relays, score motor and harnesses and scrubbed them down in a sink with a good degreasing dishwasher soap and Bon Ami with fair results, keeping the transformer, total play meter, score motor and other water sensitive parts from getting wet and allowing to dry for several days. The problem with this method is getting all of the Bon Ami and soap out. I would suggest skipping the Bon Ami and using only dishwashing soap if you want to try this. I have also used a lot of paper towels and isopropyl alcohol to clean each harness and wire. This worked surprisingly well. Do you have cloth or plastic coated wires? Perhaps others will offer up other suggestions or additional ideas for you. I vaguely remember something about washing machines and dish washing machines diverted to the task but only for the wiring harnesses themselves. LOL..... I can never "unhear" that sound now. That machine doesn't look bad at all. 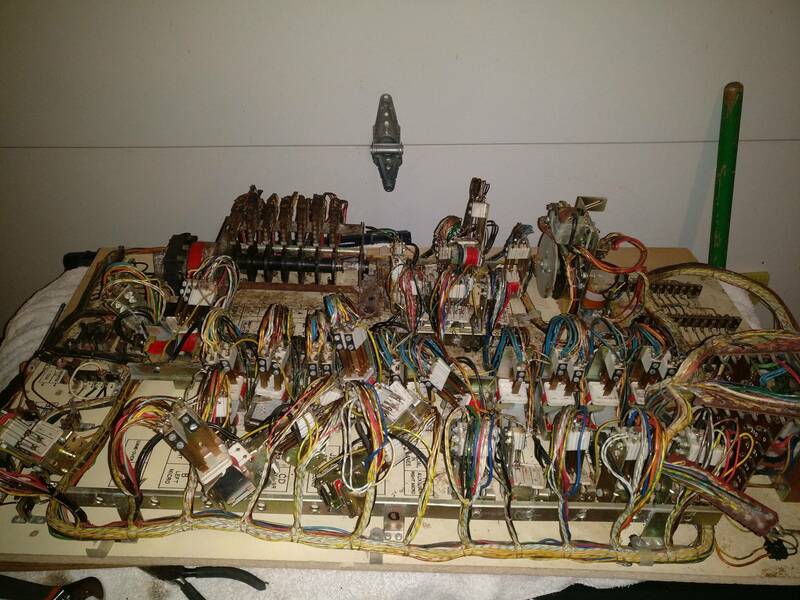 With some clean up work, it ought to be ok.
Any time I come across something like that, I always unplug all the connectors, remove the two (sometimes three) bolts that hold the bottom panel, and lift out the bottom panel. Sure makes servicing the relays, steppers, and score motor easy. Plus it save your back from all the stooping over. Makes it easier to clean/sanitize the inside of the cabinet too. The inside looks a lot like a Playmatic machine judging by the various assemblies and relay coils. 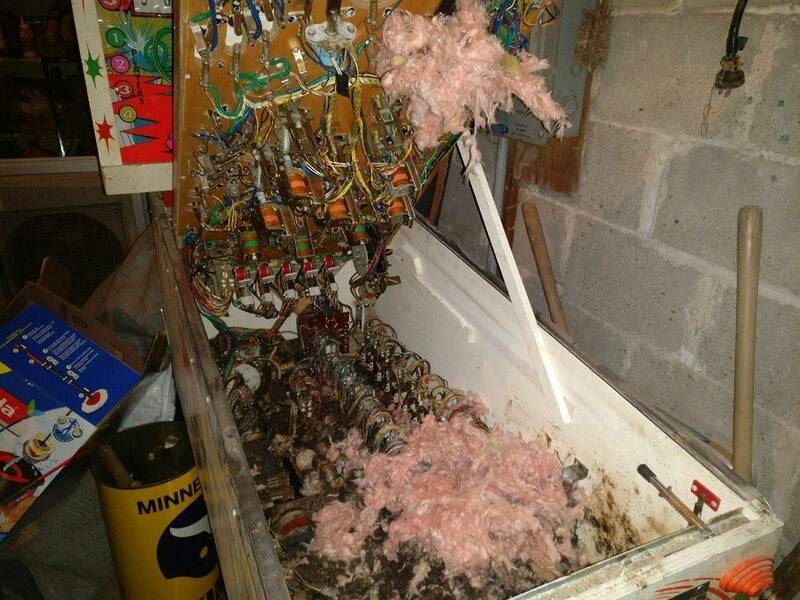 One thing you'll likely find is a bunch of bad (falling apart) light sockets throughout the machine (mostly on the playfield). 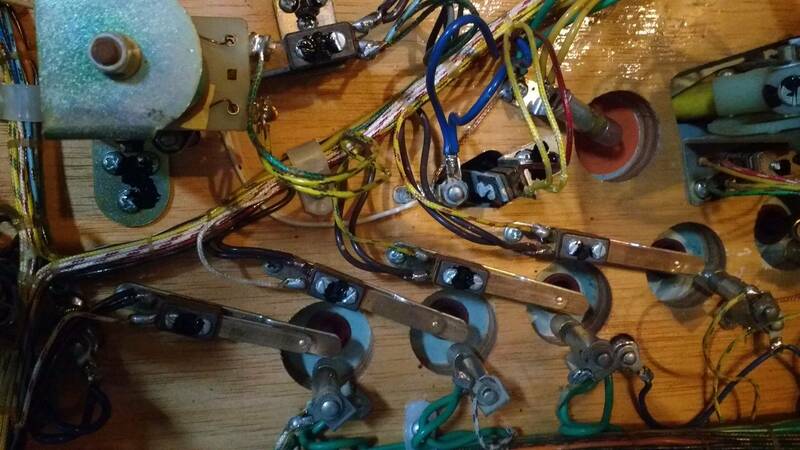 Also, many of the playfield switch stacks are riveted and fall apart. When that happens, I unsolder the particular switch and take it over to the vise. Then with a proper size of pin punch, I punch out the rivets (or drill out if stubborn). Then I take the baseplate the switch was riveted to and with a 6-32 tap, I tap the holes to thread then to 6-32 machine screws. I use screws and sometimes nuts to reattach the switch to the baseplate. It's a mix between cloth and vinyl coated wires... I'm worried about getting everything out of the cloth wires... I took the sound card out separately in order to bring it home, clean it up, and test it and I don't know how comfortable I feel with the cloth wire. Another testament to the hardiness of EM machines over SS. For future reference, if enthusiasts have "unsupervised" storage, put rat poison inside stored games. It prevents the problems completely. I'd worry that would create a whole new problem, i.e. 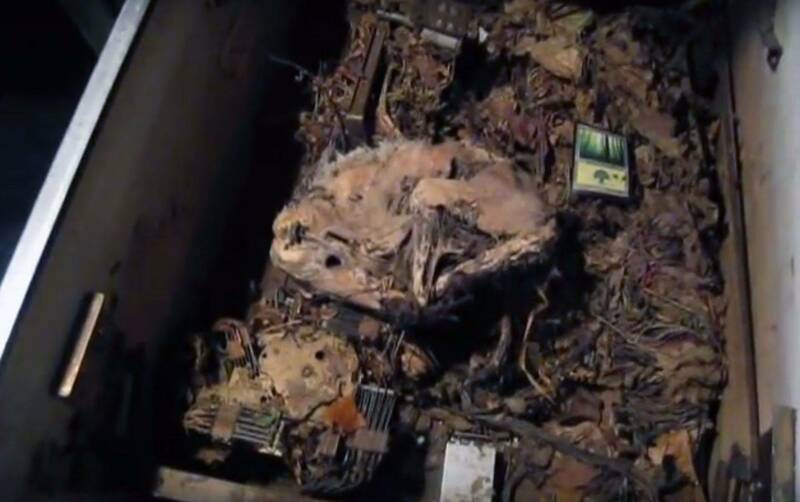 a cabinet full of rotting rodent carcasses. Save it, Dragon is a great pin!!! If you don't' save it. 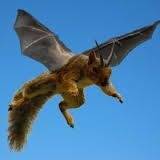 List it for sale as squirrel dragon i bet it won't sit long. Have another thread to watch now. You put poison outside the games near the legs as well as a "first line of defense" in warehouses and storage units. It works. The rodents will always go for it first, even before trying to build a nest. If the you are not the private owner, it is not like the company is going to always regularly do diligence to keep areas clear. I put poison in my "overflow" game room as well, which currently is a two car garage. Not a particular concern in other locations, but if you do not play your games, you can have surprises after a cold winter. Traps are wasteful, as they require more maintenance. 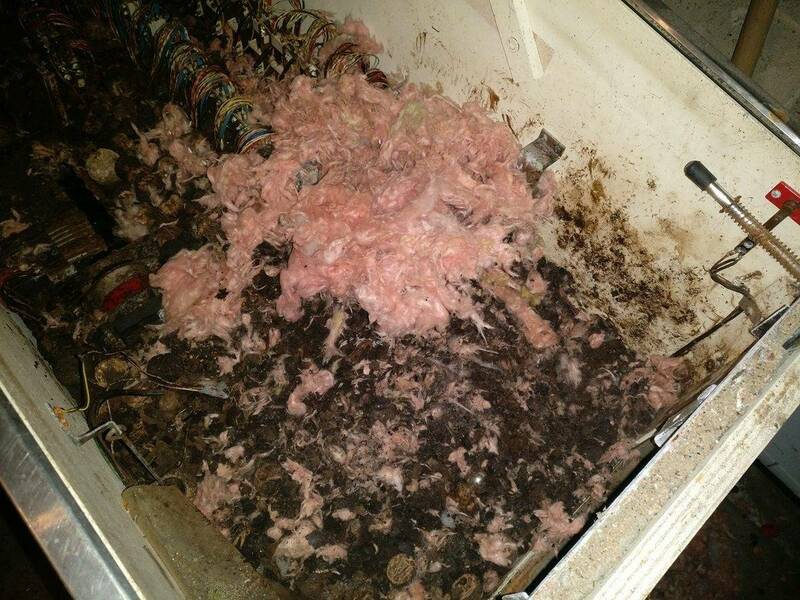 Preparation and expense is small in comparison to the damage one mouse can do inside a game, if it gets through a cabinet speaker or hole ventilation grill. It has the same importance as voltage protection from storms. Yeah, cloth is harder to clean. You can probably get by with blue window cleaner and rags for the plastic coated wires. Try lots of isopropyl alcohol and clean paper towels on a few of the cloth covered wires as a test. Most of the crud is on the surface and can be wiped off. It's tedious and slow work but it looks so much better when done. I use the opportunity to straighten any matted down wires into nice looking loops and search for the soldered ends of leaf switches touching other switches where they shouldn't be. 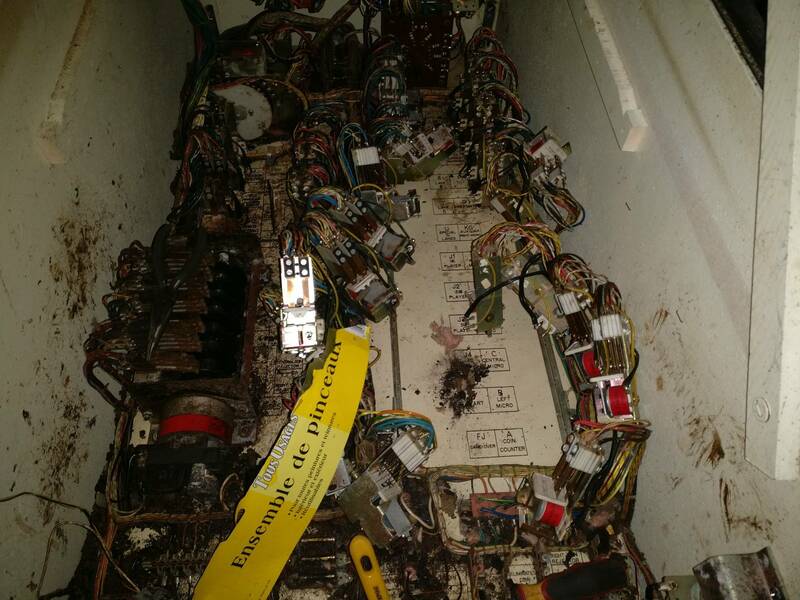 Since you've had at least one squirrel taking up residence, you might find all kinds of problems not seen in a typical restoration, like bare wires touching. 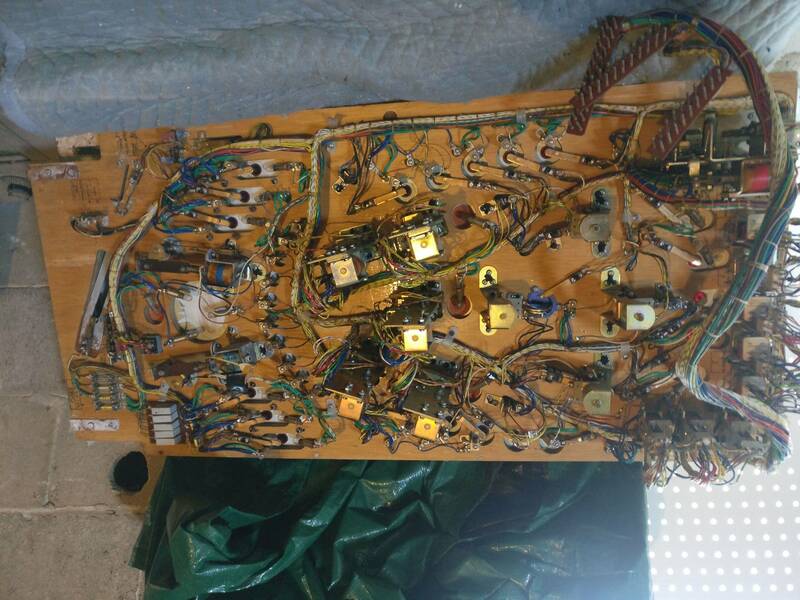 Then I do a thorough cleaning of the relays and switches with isopropyl alcohol and Q-Tips. After cleaning, I tighten the screws on the relays, if I remember, and adjust all contacts. 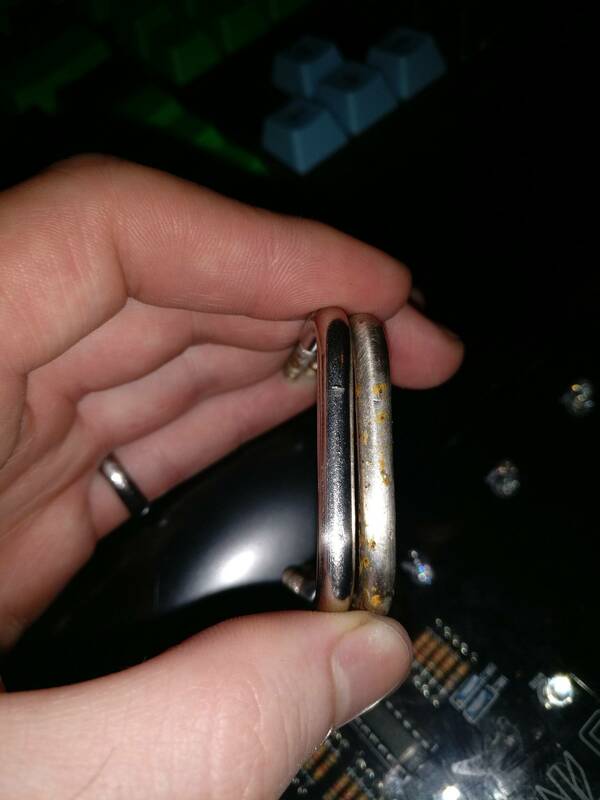 Unfortunately, I have found that cleaning with isopropyl alcohol isn't enough for some contacts. I then have to go back and find the problem switches and use 500 grit sandpaper to get them working again. 26hrs of work so far. Today we managed to take the backbox off. 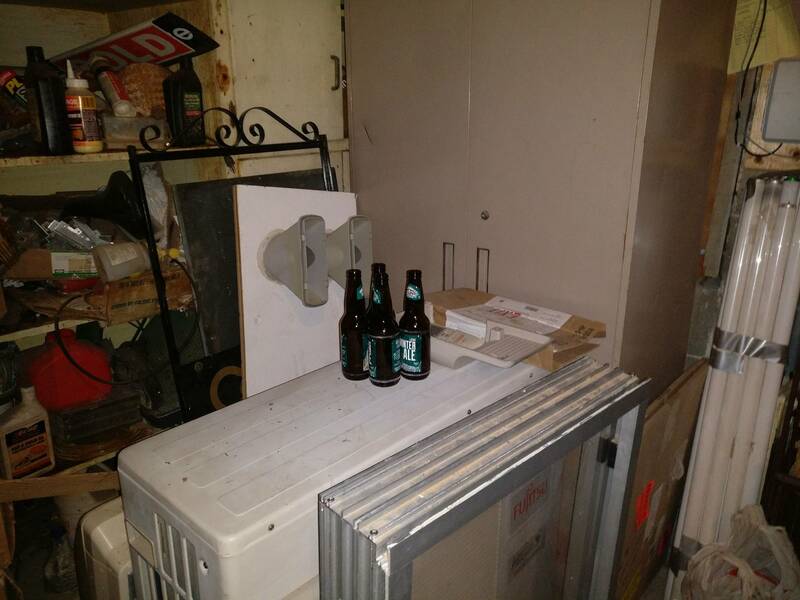 In doing so, we pulled the machine away from the wall and found a few things of note. 1. More squirrel finger paintings. 2. A LOT of damage to the bottom of the cabinet. We also took off the bottom thanks to all your suggestions as well as the play field. Most of the large debris has been cleaned up and we are attacking the rest with simple green. Not being in an insulated/heated garage means frozen cleaning product and rags. The progress on cleaning the bottom board was really slow due to that. 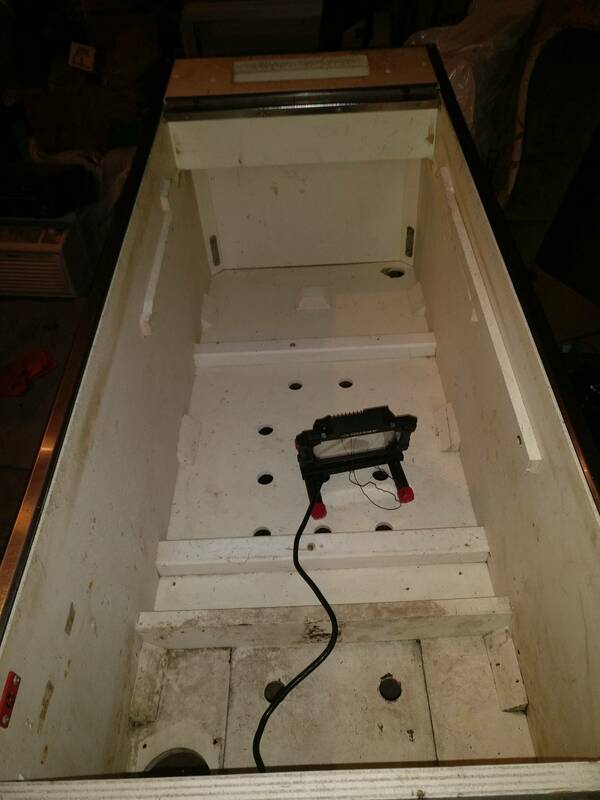 Here is a before and after of the cabinet, that is as clean as we could get it. 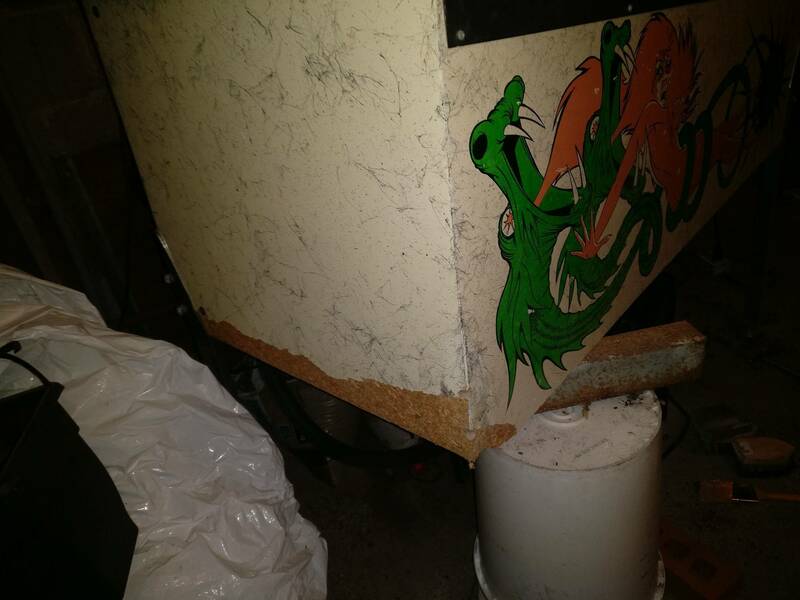 We are going to try to paint over the non playfield visible parts of the cabinet. Found the counter! The lid for it is broken, but I'm guessing the play count is 6930. 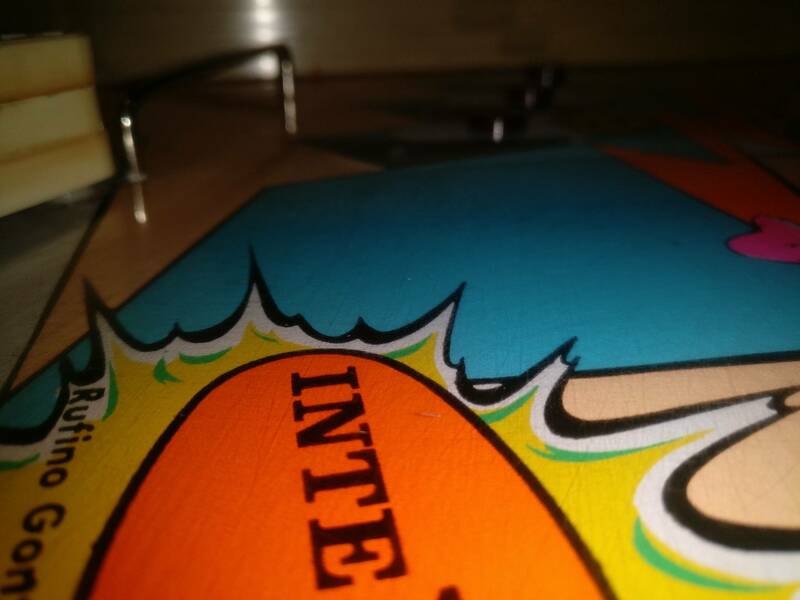 The play field and underside look excellent. Everything is still shiny looking with very few chewed wires. Wow! That looks great! Nice work! Everything is still shiny looking with very few chewed wires. I would say you are VERY lucky considering the damage that could have been done by your fine furry friend(s) there. I'm looking forward to further updates. 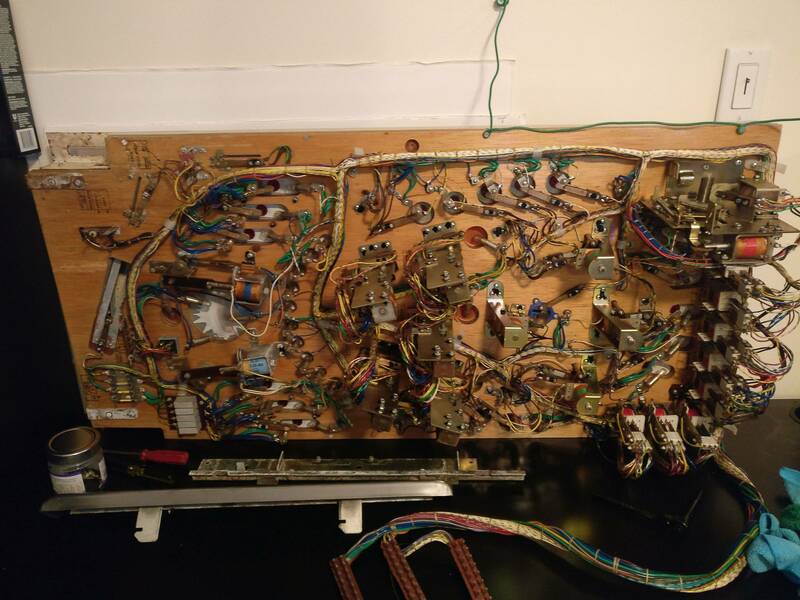 i bought a galaxian cocktail that started in similar condition. my first stop on the way home was the car wash vac's. then i took a water hose and soap to the empty cabinet. good luck, this looks like a great game. Got a couple of the big pieces home today. 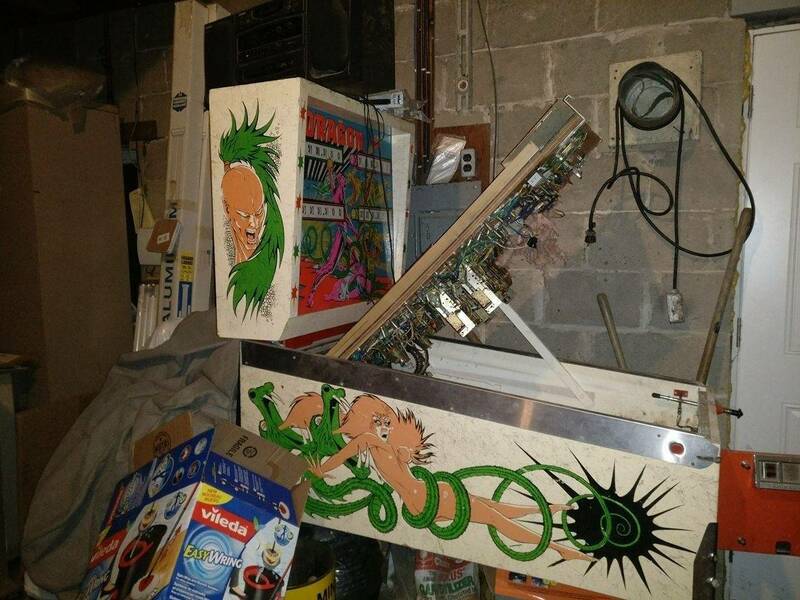 Just brought home the cabinet and the playfield. Left the glass and lots of the other pieces including the backbox in the garage. This is the temporary setup to clean up the damaged wires and test switches, contacts, solenoids and lights. Getting the cabinet ready for paint. We had to bring it into our tiny apartment to paint it because it's well below freezing in the garage. Sorry, no after pictures so far since the paint is still drying and needs another coat. We will include a before and after picture when we are done painting. Took the chance to clean up the plastics on the field. Just some dish soap and water and these look great. Used this opportunity to also size up some of the rubber for the field. I am going to be very busy over the next couple of weeks so I won't have any updates but McSparkle may have some. We were also just looking for some tips on fixing the damage to the back of the cabinet. There doesn't seem to be any veneer, just paint on particle board. There is no swelling at all, just chunks missing (about 1/2" deep in some places) Should I use plaster/bondo/wood putty? Does anyone have rubber ring sizing? I have figured out most of the sizing myself so far, and am just a little bit hazy on some of the bigger sizes. Yes, Bondo will be perfect to fill up all the little notches. For the rubbers, you may want to get a kit for that particular machine (check Marco or Ebay) or buy an assortment of multiple rubber rings and see which one will fit the best. Overall, you are very lucky that your furry nutty lover did not do more damage to that machine. It will be interesting (and challenging) to bring it back to life. Painting inside an apartment...hope you have a TON of ventilation...bet it smells lovely in there now. Hope you stuffed it....just add wings (and maybe lights) and you have a nice mod for your game! Always remember it could have been much worse. "Don't let this happen to your game." However the little b@$t@rd made off without any consequences that we know of. Sorry that I've been lazy with the updates ladies and gents. I was away for a couple of weeks working nights and then I was having some lady trouble after I returned. I'm also facing a possible lay off at work. So I took a day or two off of life to go visit my other love (my car). 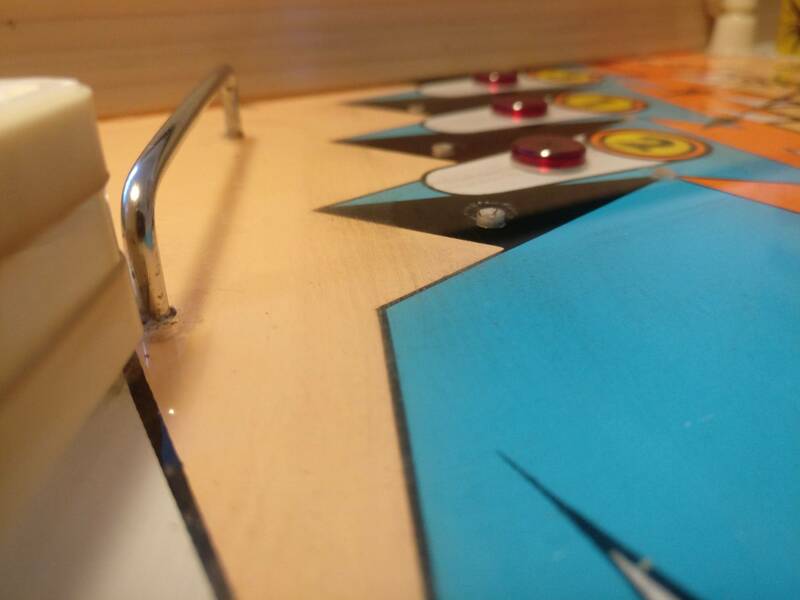 I haven't got back on a regular sleep schedule yet, due to the circumstances, and I haven't put much time into the pinball machine as a result. Finally though, I put some time into it. I didn't get a ton of work done because I was preoccupied with doing a lot of nothing. I decided to just start small and work on something that I could do sitting in my spare car seat while just listening to some music to help me feel better. 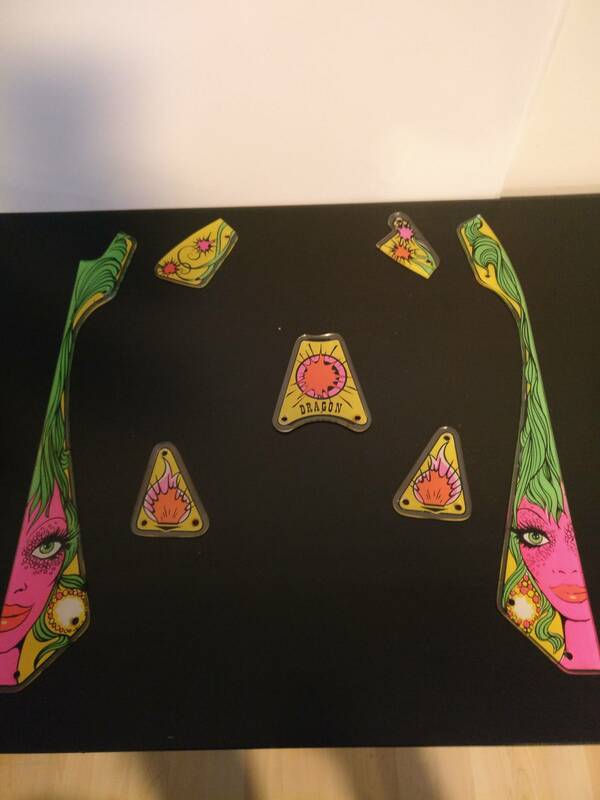 Took these metal pieces off of the playfield and figured I would give it a whack at polishing them up. 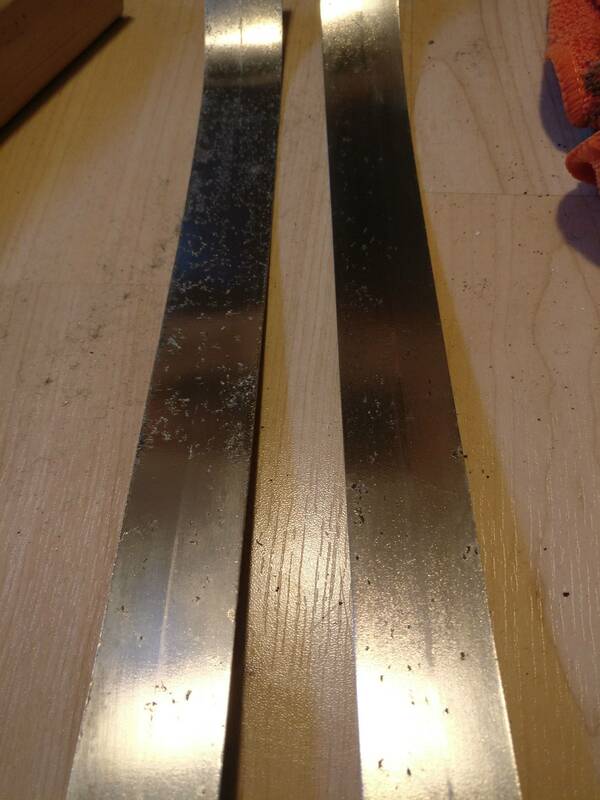 After a quick clean up with a scouring pad and some dish soap and cleaning vinegar (left), it's clear that there is some pitting and these won't be perfect. 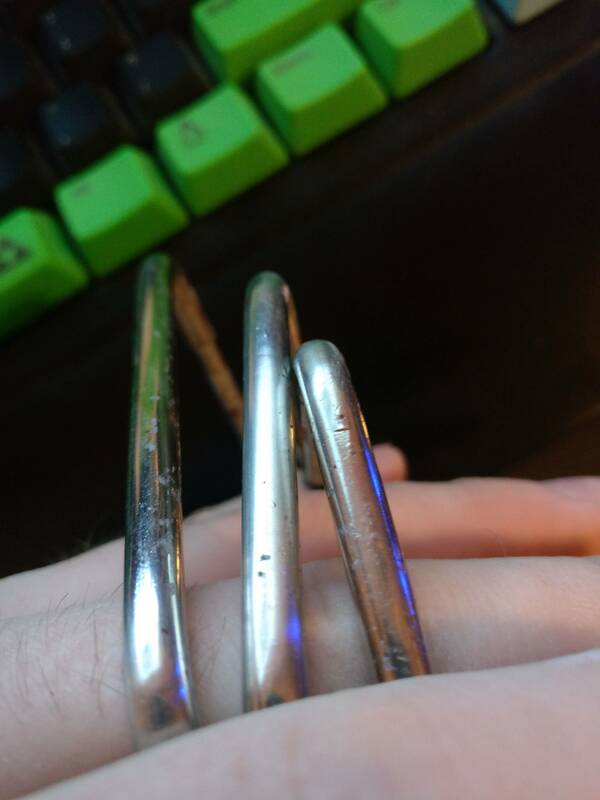 I might be able to sand them out and repolish it but I think I'm going to wait to determine if the machine has bigger problems before I spend that much time or money on this thing. 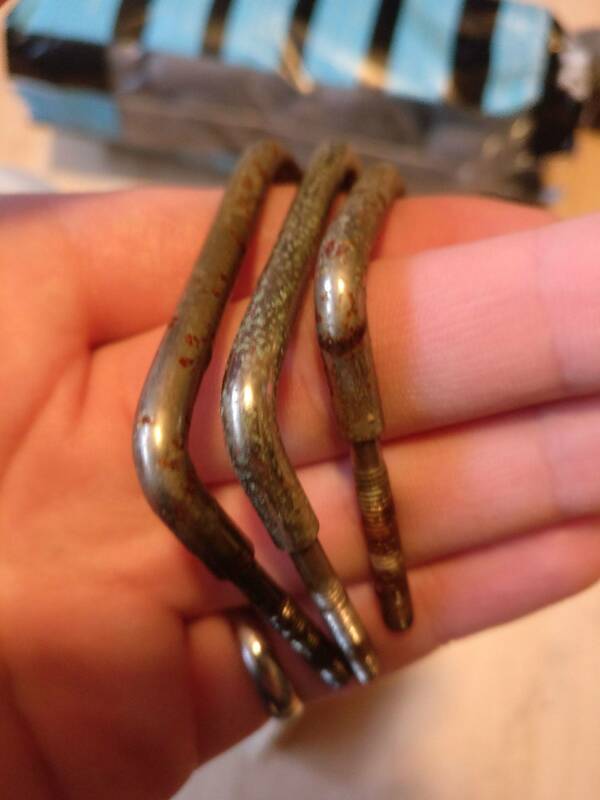 Both of these were cleaned up with the same method. 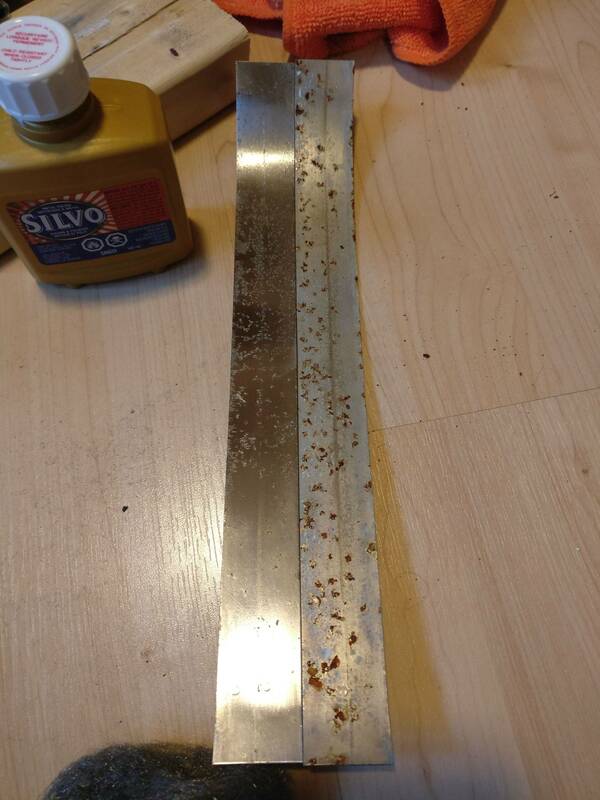 Scouring pad with dish soap and cleaning vinegar, then polished with fine steel wool and silvo. These are probably going to be the best they can get until at least the machine is turned on and tested. Next up, the lanes get the same treatment. Short lane polished (left) next to untouched (right). Three all polished up. Again, it's not perfect but I don't want to sink too much time and money into the parts of the machine that don't need it until I get it working properly. They are also a far cry better than they were before. 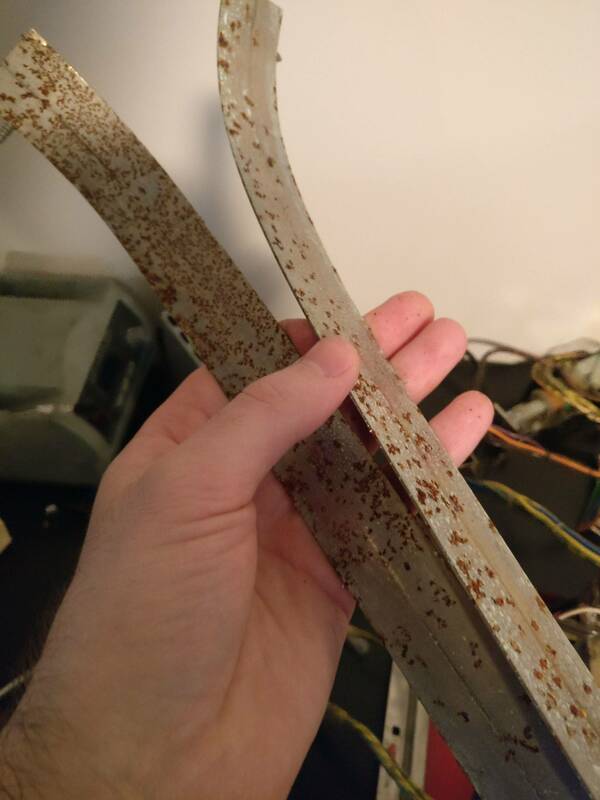 I wasn't able to pull both of these metal pieces off of the board (Sorry, I don't know the names of all of the parts). One felt like it didn't want to budge and made some cracking sounds as I pulled up on it. I still wanted to polish it so I covered the surrounding plexi in masking tape and polished it in place. Sorry again for the slow updates. It's just been a bit of a rough go. Hopefully it will pick up steam again soon. I made a long drive out to a friend's place and traded him some work in his scrap yard for a design and vinyl print for the project. 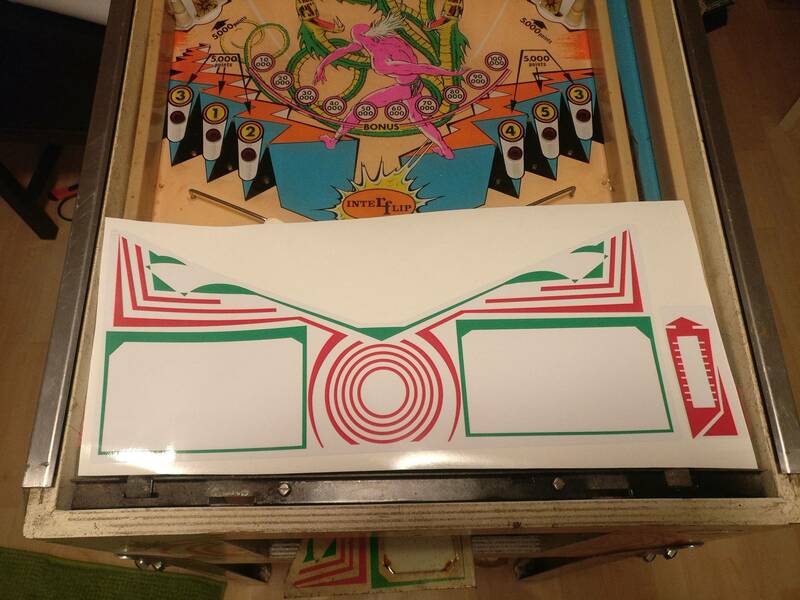 I know it's sacrilege to use computer aided design on a classic pinball machine as all the artwork is done by hand but I am not an artist by any means and it's the best I could do. This is just a shot from the long drive in this Canadian winter. 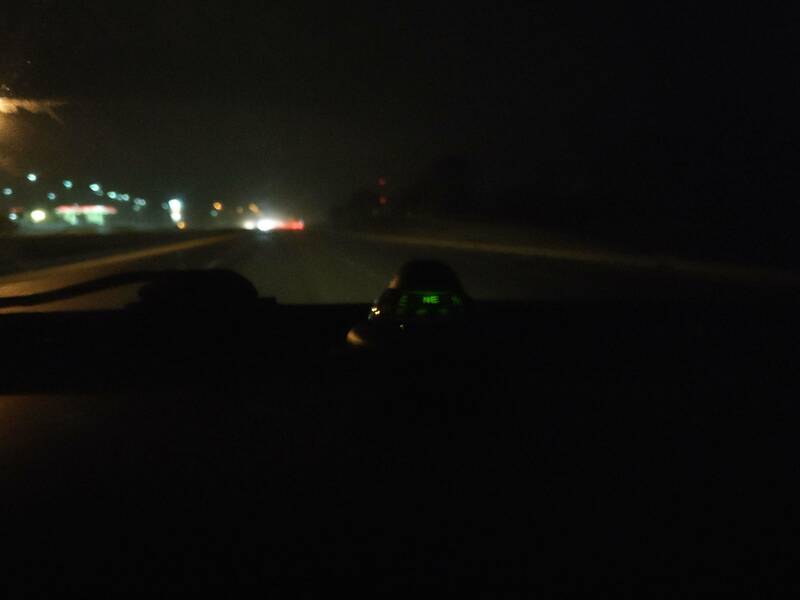 Empty roads and all clear. He did a great job copying the design and printing it. It's nearly perfect. 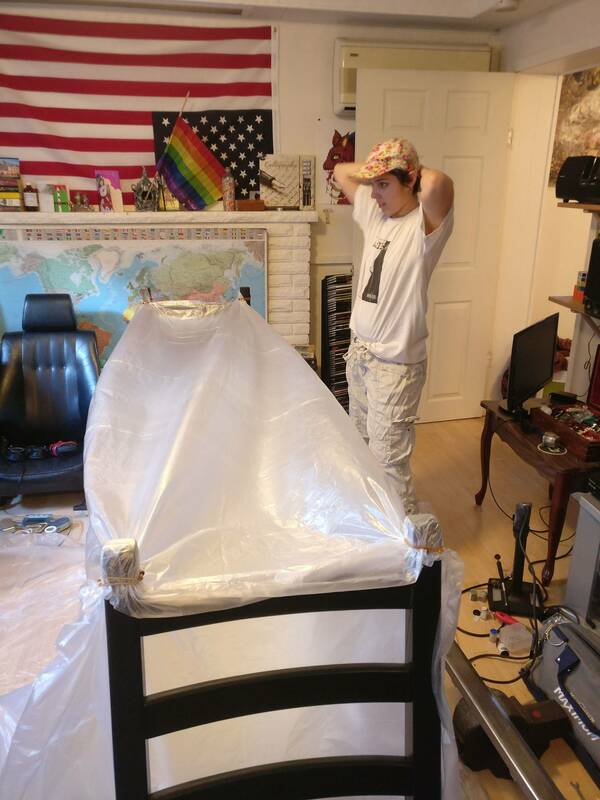 He didn't have the off-white cream colour of vinyl and wasn't sure how to easily create the marble effect on the existing piece so I told him we'd try it out on the machine and if it needs to be redone it won't be that big of a deal. 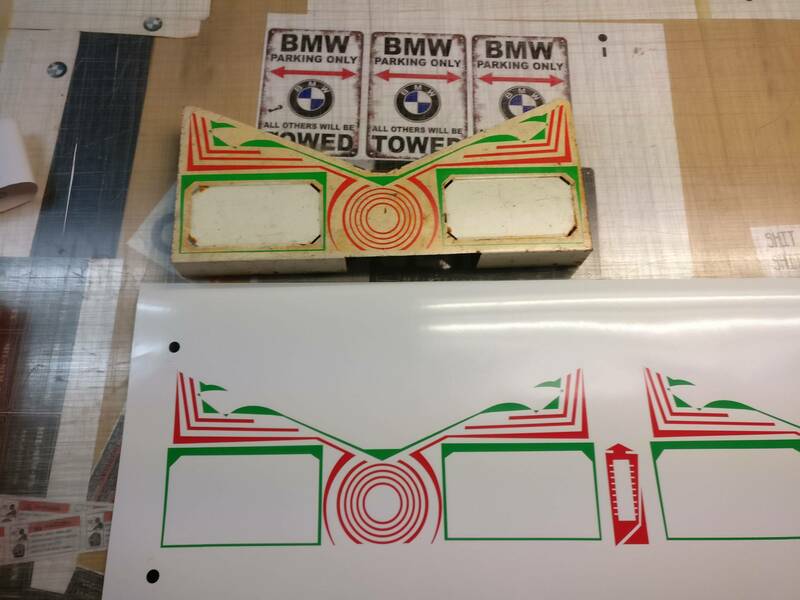 The vinyl print looks a bit stark in comparison to the colours on the rest of the machine but I'm hoping that once it's cleaned up and all put back together, it won't be too bad. Otherwise we will have to get some cream vinyl and figure out how to recreate the marble effect in Adobe. My friend is sure the marble effect could be done but he didn't want to burn hours on it if he knew we could redo it later if required. There's this extra 0 by the 30k mark on the field. IPDB notes this 0 on their website. I did a bit of digging and didn't come up with anything other than people seem to think this means it's special but no one knows why it's special. 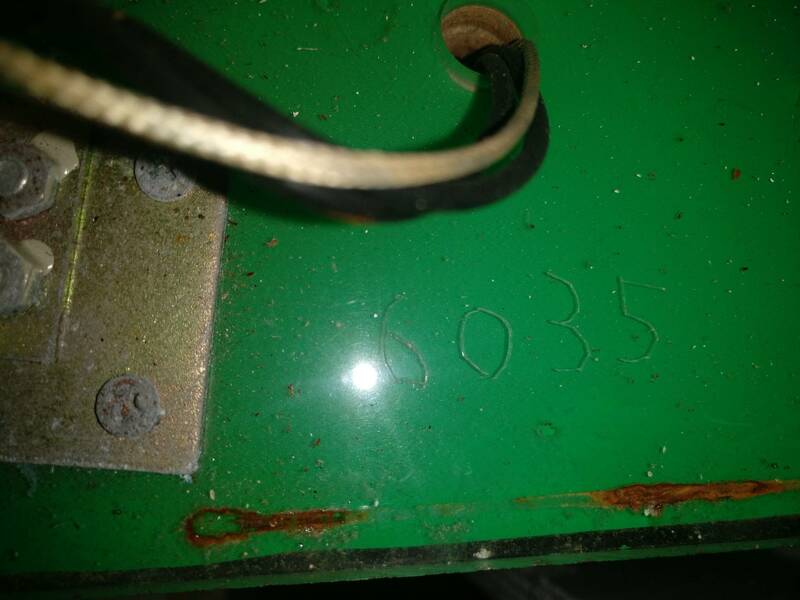 People also indicated that these fields with the extra 0 have hand written serial numbers, which is in deed the case here. 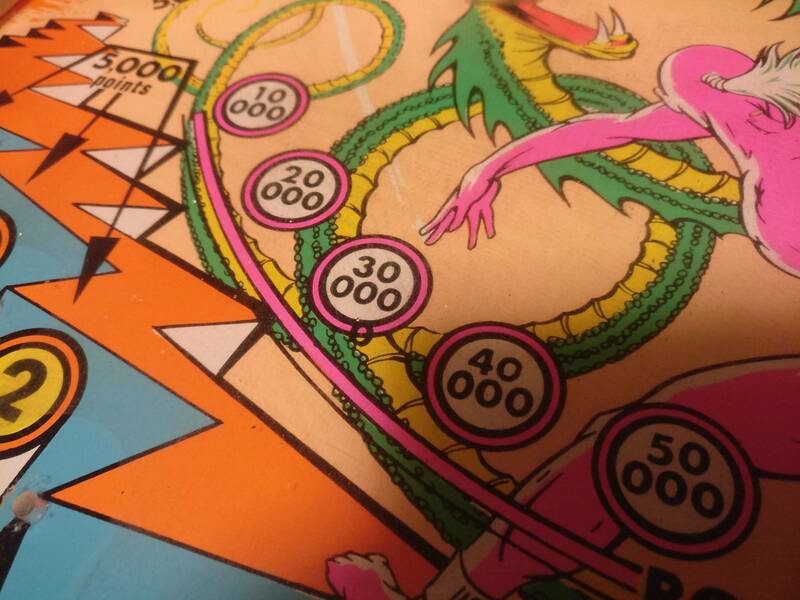 Does anyone on here have real information about this "special" mark on the playfield? 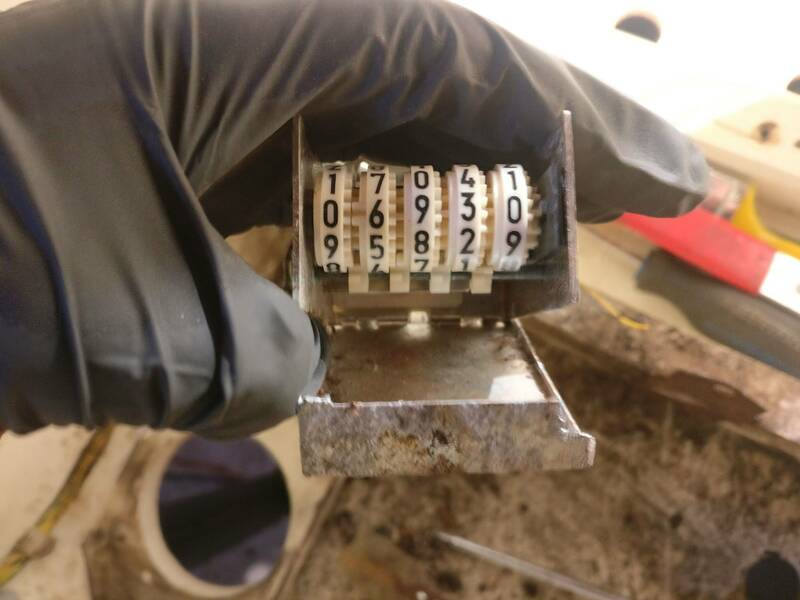 The serial number is definitely hand written, and poorly at that. 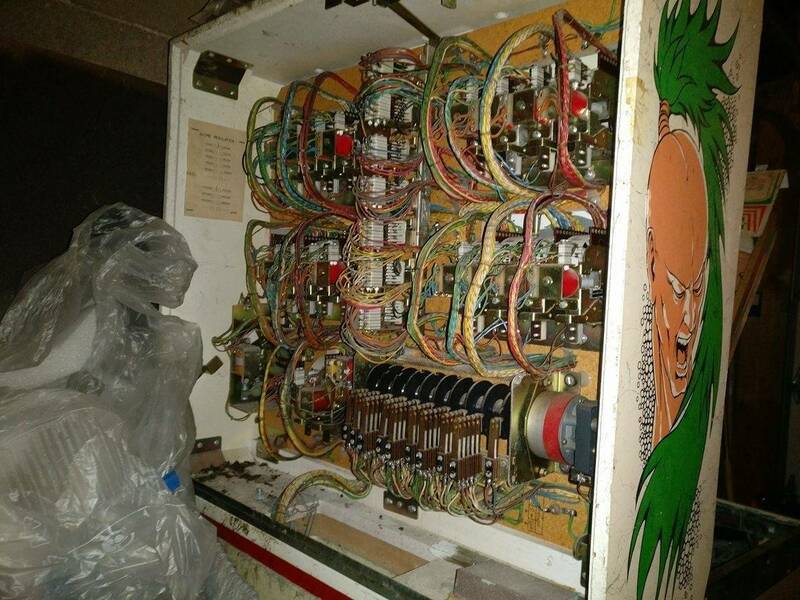 Sorry about the potato quality pictures, I was holding up the playfield and taking a picture with my other hand. 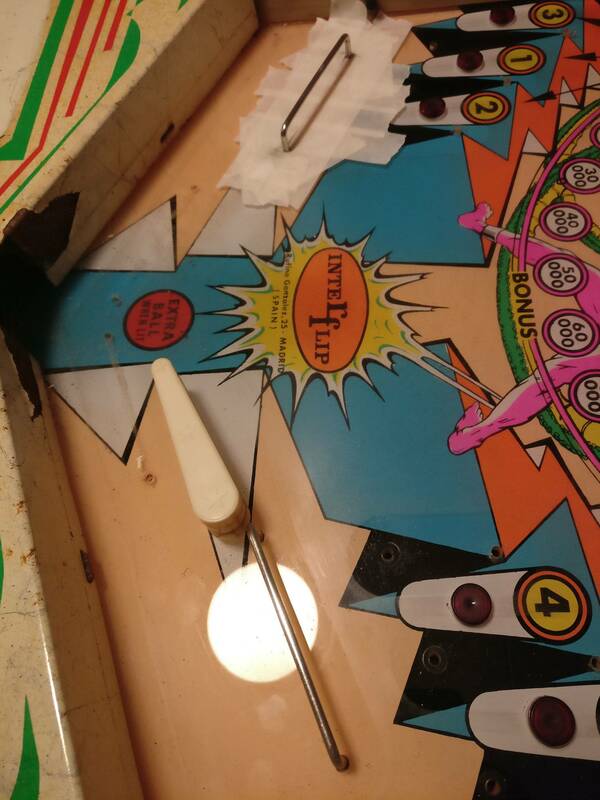 I did my best to polish out the scratches on the playfield using some Novus 2 and elbow grease. I felt as though I was more cleaning out the scratches than I was polishing them. I have a friend that's an auto-detailer that's convinced he can polish out all of the scratches and so I'm going to use his help with that I believe. Unfortunately, I forgot to take after pictures of the scratches after polishing with Novus 2. 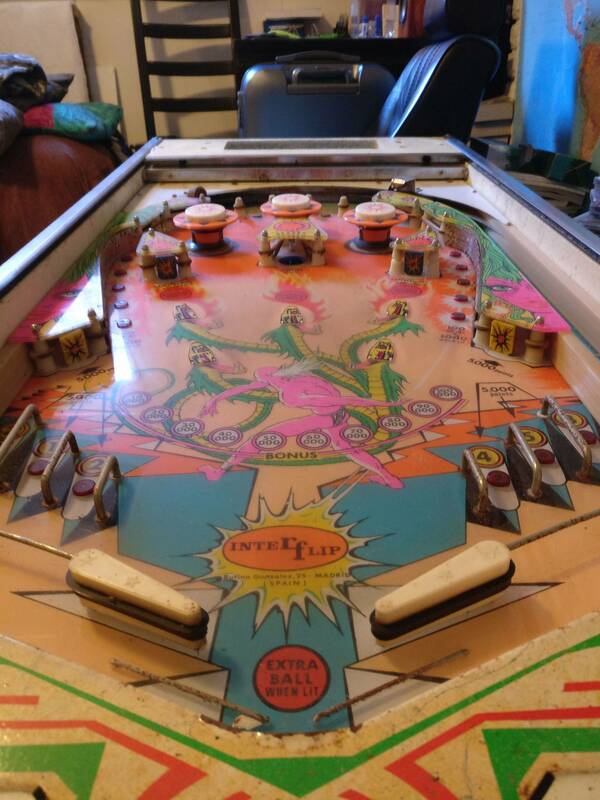 Since I'm out of town again for work, the best I can do is give you the before pictures of the playfield scratches. 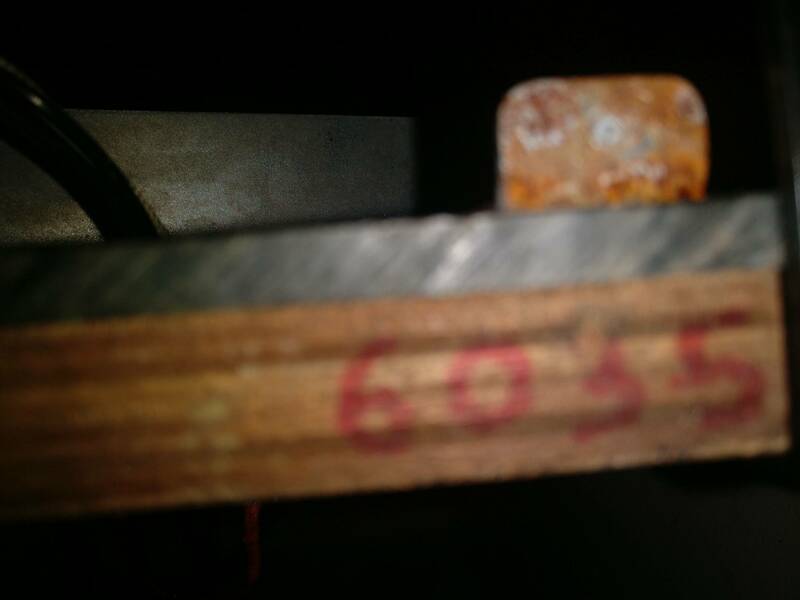 Anyone have any advice on how to remove these scratches? Or should I just have my auto-detailer buff them up for me? Ill be starting a refurbisment on a Dragon sometime soon.